‘Kote Katti Merdavrella Yenadaru?’ (‘What became of those famous persons who established forts?’) – lines of a popular yesteryear Kannada film song rang in my mind as I glided on the smooth Bellary road towards Devanahalli. Much as I tried to throw it out, the ditty rang louder and I was on the verge of humming it aloud. To my relief, I reached Devanahalli town limits. Tipu Sultan’s birthplace. Pic: PD. As you enter the town from Bellary Road, one has to take the first left to reach the fort. Alternatively, cruise down a kilometre ahead on Bellary Road and take a right to reach the fort entrance. There are two signboards- ‘Tipu’s Birthplace’ and ‘Devanahalli Fort’- pointing to the narrow lane that leads to the fort. Half a kilometre outside the fort towards the Devanahalli town stands a Memorial with a small plaque that states Tipu Sultan was born here in 1751. I had expected an old dilapidated house inside the fort. Why was the great and glorious Tipu born outside the fort when it had already been conquered by Mysore? However there seem to be no guide or guidebooks anywhere that could give more details. The boards placed by the Archaeological Society of India declare this enclosure and the fort as protected ancient monuments and defacing them would incur a fine of Rs. 5000. Looking at the posters of latest movies on the walls of the fort, the loose stones, the defacing of the temples in the name of ‘modifications’, the bastions that reek of urine, I wonder how many 5000 rupees were collected to date, if anyone had bothered to. Devanahalli history dates back to 15th century, when a family of fleeing refugees from Conjeevaram (modern day Kanchi), camped near the foot of Ramaswami betta, east of Nandi Hills. The leader Rana Baire Gowda was directed in a dream to set up a settlement in this region. Dreams are strange indeed! He and his family (known as Morasu Wokkalu) settled in a small village, Ahuti, later corrupted as Avati. His son Malla Baire Gowda founded Devanahalli, Chikka-ballapura and Dodda-ballapura. Another illustrious descendent of Morasu Wokkalu group was the illustrious Kempegowda, the founder of Bangalore city. Malla Baire Gowda requested the permission of Deva Gowda, a feudal lord, to build a fort and was granted both the monies and permission on the condition the place would be named after him. Accordingly, in 1501, a mud fort was built and the town was named ‘Devadanahalli’ or ‘Devanahalli’. This was under the rule of the ‘Gowda’ family until it was conquered by the Wodeyars under the command of one Nanja Raja in 1749. The fort gave in after a gallant defence of eight months. Devanahalli Fort. Pic: Poornima Dasharathi. It was during this battle that Haider Ali, a volunteer horseman, showed his prowess. Devanahalli brought him fame and fortune and also became the birthplace of his son, Tipu. Tipu also renamed it as Yousafabad which never got popular. In the years that followed, the fort was conquered regularly by the Marathas, the Mysore kingdom and the finally in 1791 by the British, under Lord Cornwallis. The fort itself is built of stone, in an oval shape, flanked at the corners with circular bastions. The entrance is quite small, comfortable enough for the horses of yore, but obviously not designed for a modern day SUV. The roads are smooth and lots of bikes keep driving in and out. I guess the Kawasakis and Hero Hondas are today’s equivalent of the horses of the old times. As one enters the fort area, green fences cordon off the temple areas; a few yards ahead the lane forks. Krishna dancing on the snake – Venu Gopalaswamy. Pic: PD. On the right is the famous Venu Gopalaswamy Temple, facing the main road of the Pete (town) inside the fort. The Temple has a traditional courtyard with a ‘Garuda Stamba’. Along the temple walls are carved pictures that describe the stories from Ramayana and Lord Krishna’s feats as a child. On the pillars of the main entrance stand two horsemen with swords unsheathed. The style of sculpting reminds one of the Hoysala period of architecture. For visitors, the temple is open between 9 and 11 AM and evening at 6 PM. However, the priest stays in a small house beside the temple. If you find the temple closed, just knock on his door and he would oblige and open the temple doors. But don’t just rush to his house; there are two small but fierce Pomeranian dogs guarding it. In fact, there are a lot of dogs around this area, mostly mongrels. I was greeted by a growling mongrel at the Siddalingeshwara temple, a few yards away from the Gopalaswmay. I was only too glad to see the priest’s wife who opened the door. Next to Siddalingeshwara is a Raghavendraswamy Math. Across the street is the ages old Chandramouleshwara Temple. On the left of the main fork, stands yet another old temple dedicated to Anjaneya. Right opposite the Venu Gopalaswamy, a Maramma temple is in the making. All these temples are undergoing modifications – an additional gopuram, a bigger entrance or marble flooring – sponsored by its wealthy devotees of course. In the process, the original temple structure is only visible in old photographs. Why so many temples? Range Gowda, an old veteran of this town replied with some pride that the temples have been there for generations and puja is still performed here. ‘See the teru over there’, he pointed to an old chariot in an enclosure, ‘it is used once a year to parade the idol of Gopalaswamy around the town’. A plaque at the doorway denotes the age of the chariot – in the Shalivahana year of 1822. He urges us to walk on the fort ramparts. As I speak to him a crowd starts to gather, each of them posturing as volunteer guides. I scoot, thanking Range Gowdru for his help. A view of the main street inside the fort. Pic: PD. The fort houses a small thriving town full of old houses. I saw a lady taking her kid home from school, several people driving bikes, a poster on computer classes. Some boys were walking on the ramparts – a walk on the fort for them must be as common as a walk in nearby park for us. They all were leading normal lives, the only difference being that their houses were inside a historical but neglected fort. There is a small patch of cultivated land outside the fort. A couple of men were busy gathering ‘knolkohl’ produce to be sent to City Market. Devanahalli is also famous for its ‘Chakotha’ fruit. Next time you visit the fort, taste the famous fruit or buy some fresh vegetables here – way cheaper than in Bangalore. Devanahalli is now well-known for the Bangalore International Airport (BIAL), which is a few kilometres from the fort. Like the legendary Phoenix, this old town has emerged from the dusts of history and is once again recognised for its ‘modern kote’, the BIAL. If you have an eye for the visual arts, you’re in luck. 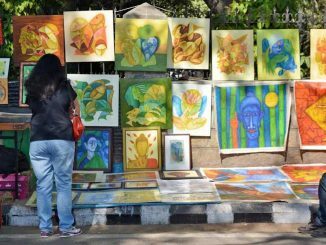 Namma Bengaluru is home to several art galleries which showcase a plethora of work. Here are some of the must-visit galleries in the city. Debutant director Pawan’s film has been doing well at the box office. But his anti-piracy moves have landed the film in trouble with the censor board. Unlike many other pavement-less areas in Bengaluru, Seshadripuram actually has roads with pavements, made of granite. In a ‘beautification’ spree, the BBMP is replacing the granite slabs with concrete tiles. I have given the dates as per the references mentioned. The story is not mine but as per B.L.Rice, the official author of the Mysore State Gazeteer. whoops !Even i have typed it wrong ! Sorry PD for this belated response. i just go to this on random google search. Your story says: This was under the rule of the ‘Gowda’ family until it was conquered by the Wodeyars under the command of one Nanja Raja in 1749. The fort gave in after a gallant defence of eight months. I should have typed 1746 to 1747 ! Nanja Raja you have alluded to is Dalvoy Karachuri Nanjarajiah! Thanks Anu. I guess the fort might get more prominence from the tourism dept now since its near the BIAL airport. Very Interesting Story. A small correction – at the risk of nitpicking. I have not said ‘1949’ anywhere in the article. The details are as per the references provided and not just a peep into Wiki. Thanks for stopping by to read these articles. Around 1743, Maratha’s had lost Trichinopoly and it was a great blow to Maratha power and pride. Maratha’s had already sold/lost Bangalore in 1687. Now they tried to re-establish their authority around Bangalore so as to secure a base for their war in carnatic against Nizam. Their Sardar Babu Nayak set about meddling in the affairs of Morasanadu and conquered the forts of Begur and Yeliyur (Near Devanahalli). He also instigated the Morasu Chieftain Range Gowda of Doddaballapur – a feudatory of Mysore, to revolt and occupy Devanahalli fort. At this time Karachuri Nanjarajiah was the Dalvoy of Mysore and also father-in-law of the then King Immadi Krishna Raja Wodeyar. Bangalore fort was under the command of Katti Gopala raj Urs (Father of the Redoubtable Rani Lakshammanni, who later married the King. After the usurpation of the Kingdom by Hyder and his son Tipu, she fought relentlessly for their down fall. She survived to install her own great grand son Mummadi Krishna Raja as king of Mysore in 1799. Malleswaram has a college named after this brave Queen – Maharani Laksmi Ammanni college). Hyder and his elder brother Shabbas, were working at Bangalore under Katti Gopalaraja after being redeemed by paying 10000 varahas by the Dalvoy to the subedar of Sira. Range Gowda’s revolt and capture of Devanahalli made Karachuri Nanajaraja and Katti Gopalraja Urs to retrieve the position.They besieged Devanhalli fort for nearly 9 months (august 1946 to april 1947)( not 1949 as the author says) and ultimately captured the fort and Range Gowda was deposed. Hyder excelled in the war and captured the attention of Karachuri and thus started his relentless march to fame and power without brooking any challenge even from his master Karachuri in later years or his fried Khande Rao.